Following the 2015 release of Lodge’s critically acclaimed “10,000 Light Years Ago” album, in which its single, “In My Mind,” was nominated for “Anthem of the Year” by the influential Prog Magazine, Lodge took his new music to the stage, performing with his own band for the very first time for the United Kingdom tour. 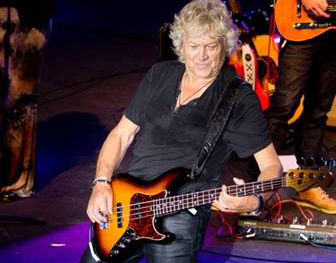 As a member of The Moody Blues since 1966, Lodge, 72, has spent much of his life touring the world as an integral member of the legendary rock and roll band. His first solo album was released 40 years ago, in 1977, but was never performed live. When asked what has taken him so long to get his own show on the road, Lodge was quick to point out, with a smile, that he has been busy with his “other band”…and has also been making wine! John has won several international awards for his “Krisemma” line of wines. Lodge recently spoke to Baltimore Post Examiner.com about his tour, his album and what it would mean to get inducted into the Rock & Roll Hall Of Fame, as The Moody Blues are on the ballot this year. BPE: What would it mean to be inducted into the Rock & Roll Hall of Fame? JL: Just to be nominated is a great honor because when I started playing my bass when I was 14 or 15, I quickly knew that’s what I wanted to do – just play. I wanted to be on stage, just playing. But to look back now and see we’ve been nominated, it means a lot because it shows you’ve really touched the lives of so many people and really influenced them. BPE: What’s the reason you’ve played three recent show in the Baltimore-Washington-Virginia area? JL: America in general has been great and loyal to me throughout my career, since I first came here in the 1960s. I’m from a very hard-working city in England and I think the people in this area can connect with that. BPE: What’s been the key to your success? So may of The Moody Blues’ songs continue to resonate with audiences today. JL: A big part of it is that we’ve always written our own music – we’ve never had anyone else write it. When we put out an album or a song, our fans know we believe in the music because we wrote it. We write songs about what’s going on in our lives, like our problems and everything else that is going on. It doesn’t matter what age you are, if you are 20 or 40, if you can connect with the song when you hear it the first time, you will always connect with it. BPE: You are 72. How much longer do you see yourself touring? JL: I don’t know. I remember when I was 9 years old living in Birmingham, England, and I was sitting in the front row of the balcony watching Buddy Holly and the Crickets and I couldn’t take my eyes off the stage. I knew that’s what I wanted to do. I wanted to be the one on stage and someday be the one a 9-year-old boy is watching. ← Is Sheriff Joe Lombardo lying or incompetent or both?